To the best of our knowledge this information is accurate, however, due to the uniqueness of products grown in nature, it is the sole responsibility of the installer to select the appropriate product for any given installation and site condition. 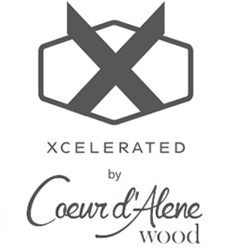 We recommend that the installer check and follow local building codes and apply Best Practices in handling and installing Coeur d’Alene Wood’s (“CdA Wood”) Xcelerated brand products. Additionally, installers should follow manufacturers recommended application and maintenance instructions when using finish and fastening products. Any guidelines provided by Coeur d’Alene Wood below are only suggestions and CdA Wood makes no representations or warranties regarding the applicability of your specific situation. Xcelerated Pine CdA Wood primarily uses Gorman Craftsman Grade Lodgepole and Spruce or Ponderosa Pine #3 or better for its Xcelerated Interiors brand of products. Our first-of-its-kind double-sided wood is textured with a band sawn face and a circular sawn back in 1×6” and 1×8” T&G with a penny gap and a center match back and 1×3” and 1×4” trim. Xcelerated AYC CdA Wood primarily uses Alaskan Yellow Cedar (“AYC”) for its Xcelerated Exteriors brand of products. AYC is a specialty softwood that is distinctly different from other cedars in color, strength, hardness and rot resistance. Its yellow color, extreme strength, and dimensional stability have made AYC a favorite for exterior applications, including siding and trim, but it also has many interior uses as well such as accent walls, ceilings etc. AYC is notable for its durability and longevity. It is naturally resistant to rot, decay and insect damage. It resists splitting and slivering and is highly resistant to wear and tear. AYC is dimensionally stable. Warp, cup, twists and shrinkage are minimal. It is easy to cut, rip, mill and sand with regular woodworking tools. Alaskan Yellow Cedar beauty and elegance will last for decades. CdA Wood for the AYC is STK (select tight knot) graded from the mill. CdA Wood uses Gorman Craftsman Grade Lodgepole and Spruce or Ponderosa Pine #3 or better for its Xcelerated Interiors brand of products (Elite Craftsman is also available). However, once the wood leaves our factory the distributors, dealers, retailers and contractors are responsible for the proper care of our wood. CDA Wood’s products are made from real wood, not a manufactured imitation. Wood is a natural resource and will often contain naturally occurring variations in color, texture, grain patterns, mineral streaks, pinholes and knots within the raw wood itself. Boards can vary in appearance from piece to piece and even within a piece. The opposite face and edges can differ from the featured face in texture, coloring, and other characteristics unless otherwise noted. Colors range from light to dark gray tones, light to dark brown tones and charcoal to black tones. Wood expands and contracts with changes in the surrounding humidity and to a lesser degree the temperature. More humid air will cause wood to expand; drier air will cause wood to contract. This movement cannot be stopped. The objective is to bring the moisture content of the wood, as close as possible, to the level the finished product will experience in service. Acquire your lumber in advance and give it time to acclimate to the environment in which it will be used or worked. Sometimes it may be necessary to ‘stack and sticker’ lumber to allow it to properly reach equilibrium within the environment. Wood used as exterior siding can be expected to fluctuate somewhat in moisture content (based on season of year, weather, etc.) throughout its life. It will expand as it gains moisture and contract (shrink) as it loses moisture. To minimize shrinkage, warping, checking and splitting in the finished product, we recommend that Xcelerated Exteriors siding and trim be allowed to acclimate and air dry for at least 10 to 14 days (longer in damp or humid conditions), after being stacked on stickers in a dry area with good air flow. Lastly, cupping and splitting ends on a wood product is not uncommon, especially if the wood is not stored in preferable conditions or left unfastened to walls or ceilings. Application of this product should take place in dry conditions. Do not apply products over wet sheathing. Do not apply closer than 6” to finished grade or final landscaping. This product should be properly flashed when close to brick ledges, concrete flatwork, and installed no closer than ½” to these conditions. 30lb felt, appropriate moisture shield, metal flashing, polyethylene film, or a ½” air space using masonry standoffs are acceptable barriers in these conditions (local building codes to take precedent). CdA Wood is manufactured and intended as an affordable alternative to reclaimed wood and will naturally continue to age and weather. The degree Xcelerated will maintain or change color depends on the location placement and exposure to weather elements. Color change can be minimized by periodic application of a clear UV top coat. Left alone, Xcelerated Exteriors will continue to age and weather, with some colors darkening and other colors lightening as time goes on. CdA Wood recommends sealing the wood, especially if multiple colors are being used. At times, harsh weathering will cause color dislocation with unsealed wood. Ultimately, you and your installer need to weigh all factors (geographic location and climate; siding/installation type; desired look; projected maintenance costs; etc.) and determine the appropriate sealing and maintenance approach for your project. Xcelerated Interiors will not change colors if there is no outdoor light penetrating the wood for significant amounts of time. Disclaimer of Endorsement and Liability: CDA Wood is not responsible for, and expressly disclaims all liability for, damages of any kind arising out of use, reference to, or reliance on the following recommendations. No guarantees or warranties, including (but not limited to) any express or implied warranties of merchantability or fitness for a particular use or purpose, are made by CDA Wood with respect to such endorsements or information. Cda Wood is not being compensated for any of these recommendations. *We do not recommended using anything with Polyurethanes. To touch-up end cuts, scratches or scuffs, we recommend using industry standards. Treat CdA Wood as you would treat any prefinished, pre-colored wood products. Stainless Ring Shank nails or equivalent are recommended with a minimum stud penetration depth of 1 ½,’ 16” on center recommended but not to exceed 24” on center. For vertical applications blocking needs to be added to framing members 16” on center recommended for adequate fastening. Products should be fastened starting from one end to the other, not from ends to middle. Do not nail through overlapping pieces. Nailing close to the edges without drilling pilot holes can cause the product to split. In the field or the boards install 2 nails into every stud 1/3 from top and bottom of board. Joining of Xcelerated products should be done with a 22.5 or 30-degree scarf cut, and should only fall on a framing stud member, insuring both ends are double nailed. Apply give to edges to ensure proper sealing. 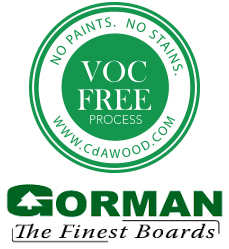 CdA Wood’s patented VOC Free process simply stimulates the organic maturing of the wood that typically occurs from extended exposure to the elements of Mother Nature. We achieve a unique color and texture on each piece of raw lumber without the use of paints, stains, chemicals or other contaminants. Furthermore, our breakthrough process incorporates a germicidal technology that destroys toxins in the wood. As a result, our wood represents the safest option for siding, trim, accent walls, ceilings, flooring and furniture because you do not run the risk of being exposed to off-gassing or VOCs associated with lead paint or numerous other stains and treatments. By using Xcelerated wood in your living spaces and work environments, you are reducing your exposure to potentially harmful VOCs that can have long-lasting negative impacts on your health. Coeur d’Alene Wood is sold “AS IS” with no warranties expressed or implied, just like reclaimed wood. 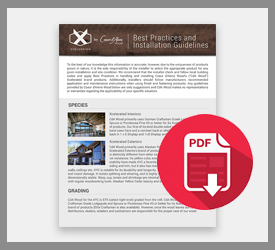 It is ultimately the responsibility of the purchaser to determine which Xcelerated products are best suited for the specific applications and how these products should be used and installed. ©2019 Coeur d'Alene Wood. ALL RIGHTS RESERVED.